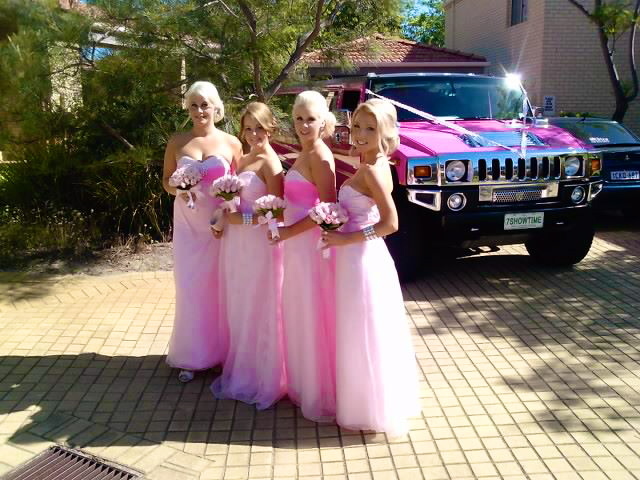 This is an example of a beautiful wedding in Perth in the Pink Hummer Wedding limousine. The bridesmaids were wearing soft pink with matching soft pastel pink posies as well as diamante bracelets with diamond and baby pink stones. The bridesmaids look immaculate and the bride was stunning. The bride wore a brilliant white wedding dress with soft pink diamantes through her veil and bodice of her wedding dress. The wedding ceremony was held in Cottesloe with the photo locations in Hillary’s and Kinross. After all of the wedding photos were taken with the bride and groom, the wedding reception commenced at The Crown. Stretch limousines Perth are a must have for your bridal party requirements on your wedding day. Soft pink bridesmaids dresses and the Pink Hummer Limousine Hire. Pink Hummer Limo Perth service by Showtime Limousines fromon Vimeo. 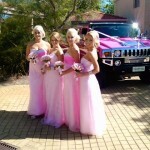 There are 5 different Pink Hummer Limousine sizes in Perth.